When someone says Caribbean, I am sure most people think idyllic beaches, sunshine and relaxation. When I hear the word, I think remarkable wildlife and lush habitats teeming with a delightful array of animals and plants. Reflecting on Charles Darwin and his groundbreaking discoveries about how species evolve differently on islands compared to on the mainland, I found myself heading to Anguilla, a UK overseas territory, to work on the conservation of one of these remarkable species – the Lesser Antillean iguana. The Lesser Antillean iguana can be found on the islands of Anguilla, St Eustatius, St Barths, Martinique, Guadeloupe and Dominica. Sadly, its population has declined by over 70% and the species is now endangered. It has actually become extinct on St Martin, Antigua and Barbuda, and Saint Kitts and Nevis. The overall population continues to fall at an alarming rate. Like other native iguanas in the Caribbean, the Lesser Antillean iguana is threatened by invasive species, especially the green iguana from Central America. Green iguanas are bigger and more aggressive, and they interbreed with the native iguanas, resulting in hybrid offspring that dilute the unique genetic make-up of the native iguanas. Other introduced species such as feral cats and dogs prey on the iguanas, killing many individuals every year. 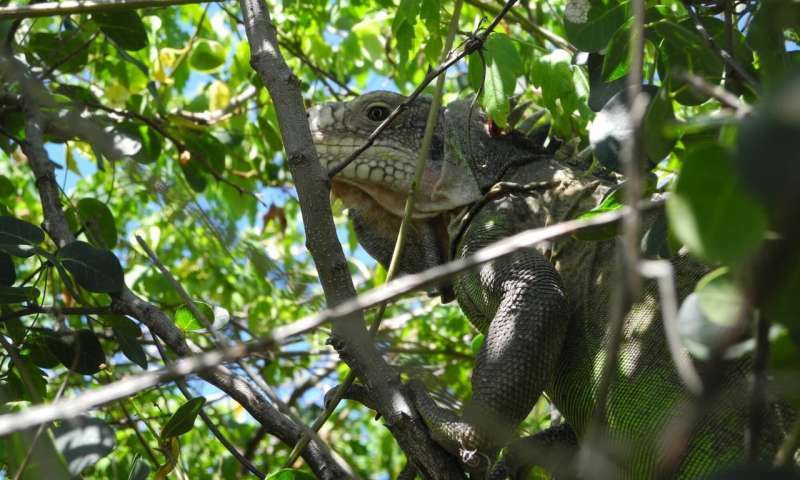 But probably the most important issue the native iguanas have to face is loss of habitat and the lack of connectivity between the different areas they need to survive, as they feed and lay their eggs in separate places. The development of the islands for tourism is allowing less and less space where the iguanas can feed and live in peace, and the roads that bisect their traditional habitat are often a death trap for them – collisions with cars are a major cause of mortality. Last month, representatives from three territories (Anguilla, St Barths and St Eustatius) came together with the support of the BEST Initiative (European Commission), Fauna & Flora International (FFI) and Durrell Wildlife Conservation Trust, and guest experts from neighbouring islands to create a strategy to conserve their native iguanas. Over the course of a week, the Anguilla National Trust, Agence Territoriale de l'Environnement de Saint-Barthélemy and St Eustatius National Parks discussed the threats that menace the Lesser Antillean iguana in the islands, and how to mitigate these problems, coming up with a set of actions that will be implemented in the next few years and that will lead to the stabilisation or even increase in Lesser Antillean iguana numbers in the different territories. The participants also had the chance to learn from each other and discuss how to face common challenges by working together. But not everything was hard work! We found the time to visit Anguilla's British Governor, Mr Tim Foy, who is particularly interested in the work developed by the Anguilla National Trust to save the iguanas. In order to stretch our legs, we went out on two nights to visit one of the locations where the iguanas live in Anguilla. We visited the Prickly Pear Cays, where a reintroduction programme is underway to save the iguanas from the threats on the main island. One of our nocturnal incursions led to the capture of a juvenile on the Anguilla mainland that, if it proves to be a purebred Lesser Antillean iguana, will become part of the reintroduction programme to the cays. It is always a pleasure to work hand in hand with our partners on the ground, but in this case I also had the opportunity to get involved in a peer-to-peer learning process and to witness people from the different islands engaged in complementary projects and supporting networks geared towards a shared conservation goal. 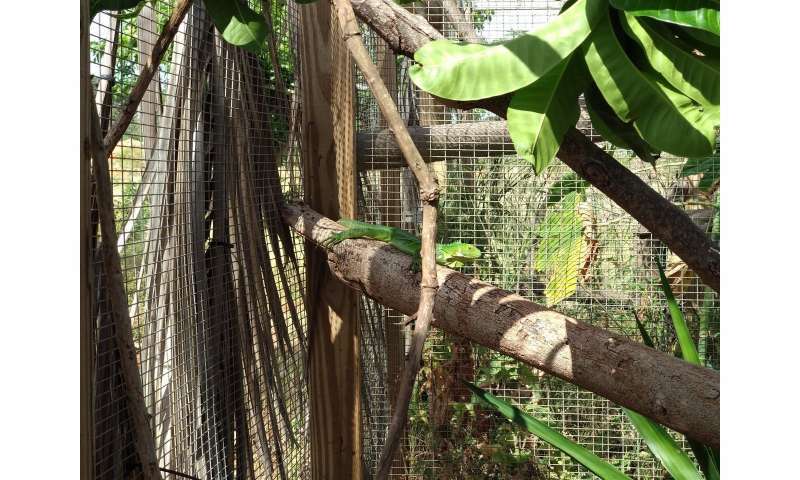 The experience provided me with a feeling of hope for the future of the Lesser Antillean iguana and other species in the Caribbean. The iguanas couldn't be in better hands!